Is your mouth watering looking at this picture? 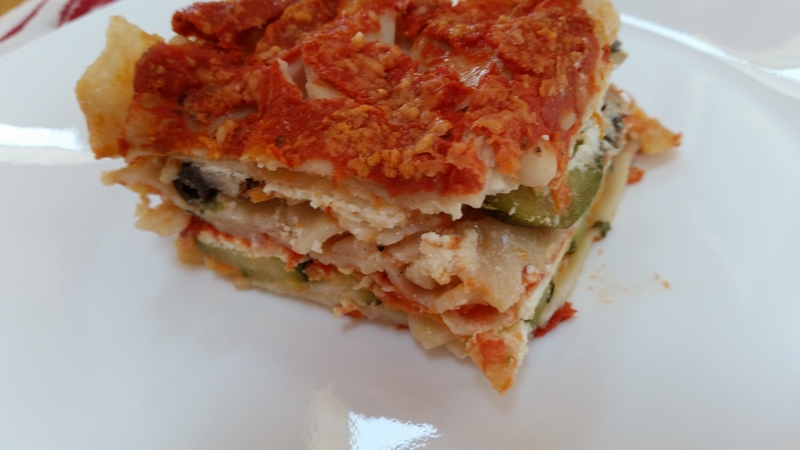 If so, then you need to make this gluten-free lasagna and make yourself happy! 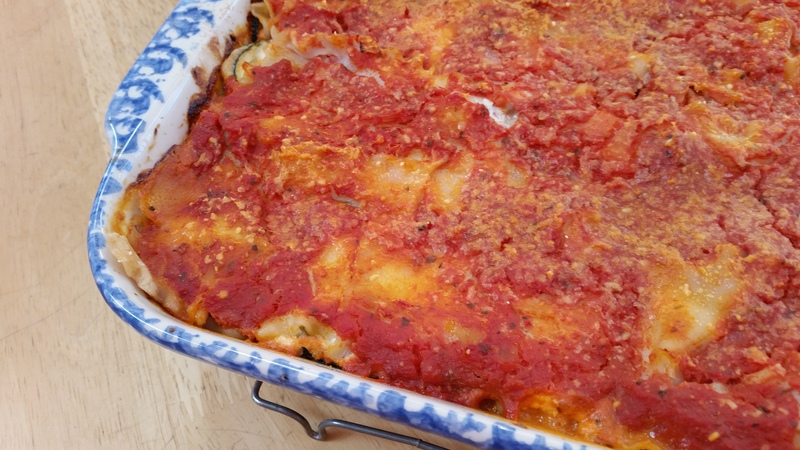 Lasagna has always been a favorite meal in our household. The saucier and cheesier the better! But when Daria and I were diagnosed with celiac disease, our meals changed quite a bit….especially the Italian ones! We did have the occasional pasta but it was made by my hubby and Daria’s daddy who grew up making cavatelli with his Nana! He used Betty Hagman’s cookbook, The Gluten-Free Gourmet Cooks Fast and Healthy, like a bible. Thank God for Lewie because we were still getting used to our new lifestyle and were often sick! Fast forward to today….gluten-free products abound! But we still find ourselves shying away from the commercially produced and processed items because we feel better eating “whole” foods. as I’m sure you know what is best for you! all of the fresh and wonderful vegetables that I love. This recipe has five parts…first, make the sauce…second, blend the cheese mixture…third, boil the noodles…fourth, sauté your veggies…and fifth, put it all together! Sounds like a lot of work but it is so worth it! Sauté the onions and garlic in extra virgin olive oil in a large sauce pan on medium heat. Add the remaining ingredients and bring to a rolling boil. Then reduce heat to medium low and cook for an hour making sure to stir every now and then. After one hour, simmer for an additional hour. MEANWHILE, while your sauce is getting lovely…. Set the mixture aside and place in refrigerator. Boil ONE box of gluten-free lasagna noodles according to the package directions. Sauté mushrooms and onions in extra virgin olive oil first. When translucent and semi-soft, remove to a plate. Next, sauté the carrots, zucchini, and garlic until semi-soft. Add in the spinach and stir through the veggie mixture until it wilts slightly. Remove to the plate with the mushrooms and onions. And now it’s time to assemble the lasagna! Place sauce on the bottom of the pan, followed by noodles, followed by veggies, followed by ricotta mixture topped with a sprinkle of grated mozzarella and Romano cheeses. Make sure you end with a layer of noodles on top, covered with sauce and topped with Romano cheese! 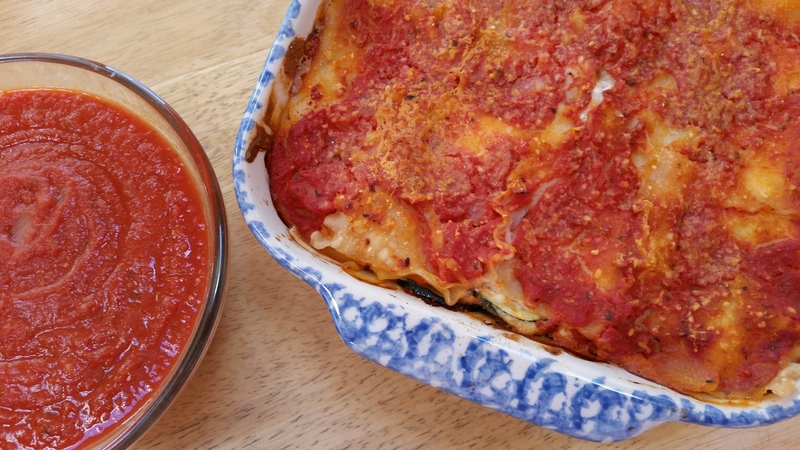 So the next time you are craving lasagna, why not try a vegetable version? You can really pump up your recommended veggie intake for the day and have fun doing it! 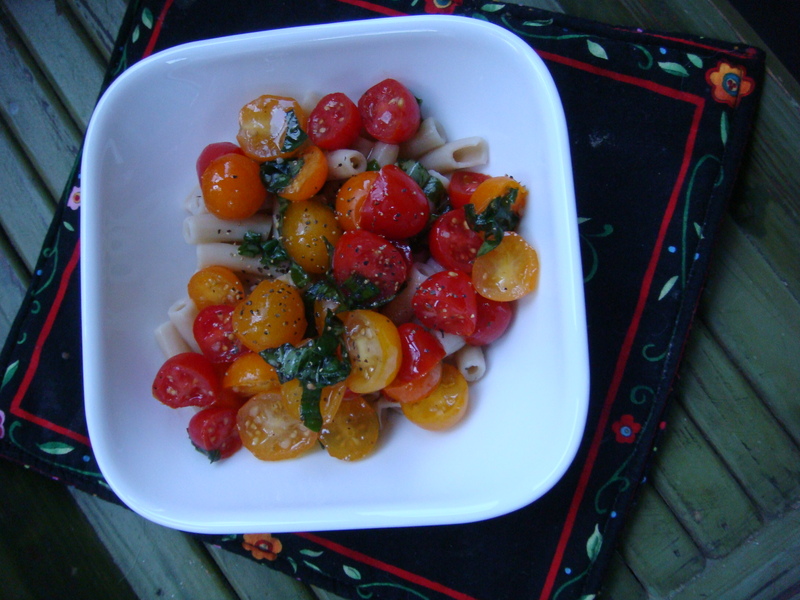 Gluten free pasta with fresh “tomato sauce”….easy as 1, 2, 3! It’s hot outside and who wants to turn on an oven? I want to make a supper that’s easy, nutritious, and has a stress-free clean-up. Being Italian, my go-to is something highlighting the Mediterranean diet and since it’s summer, what comes to my mind first is…. 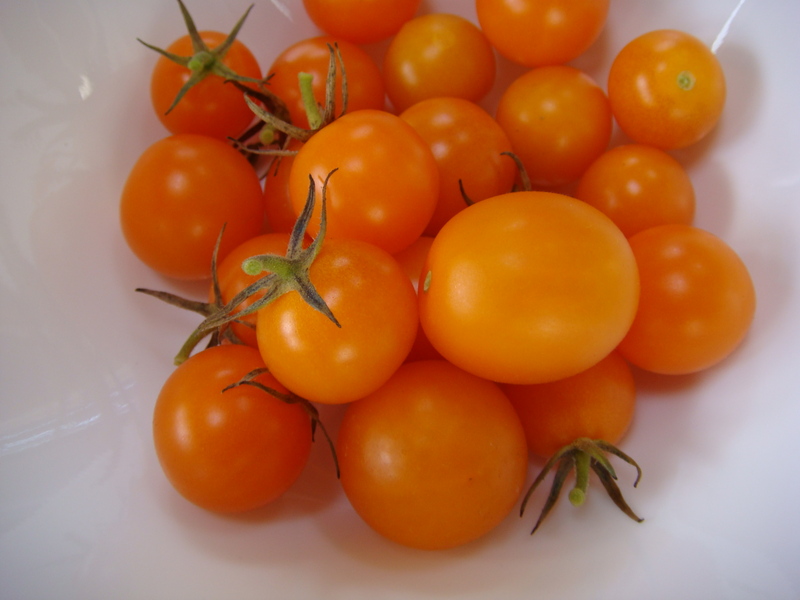 My tomato plants have given us such a great harvest this year that we have been eating tons of tomatoes as snacks, making countless tomato salads, and adding tomatoes to just about everything! 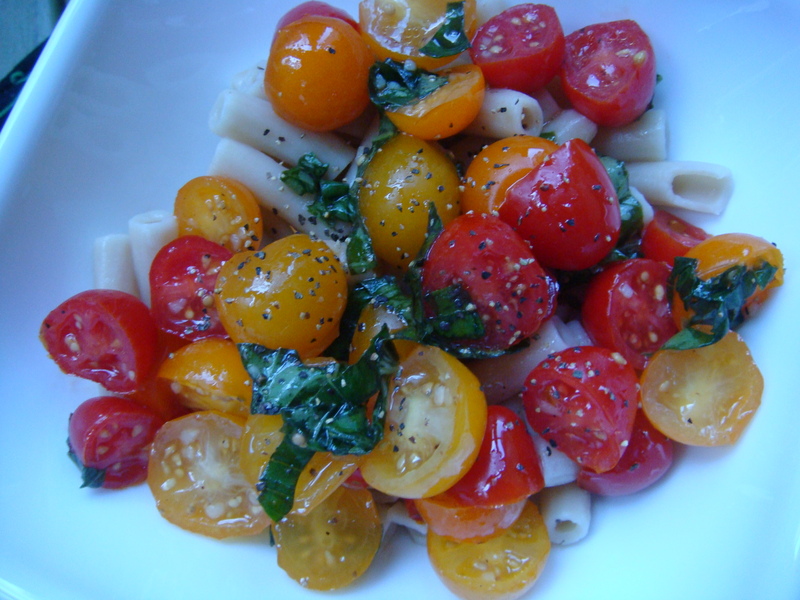 All you need are little tomatoes, fresh basil, garlic, salt and pepper, crushed red pepper flakes, and some great olive oil! Oh, and don’t forget the Parmesan cheese! 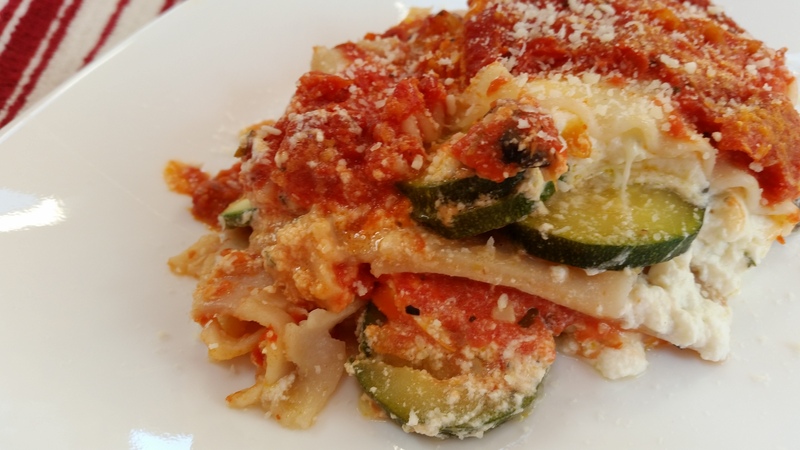 The key to this pasta dish is to decide on it EARLY in the day and here’s why! 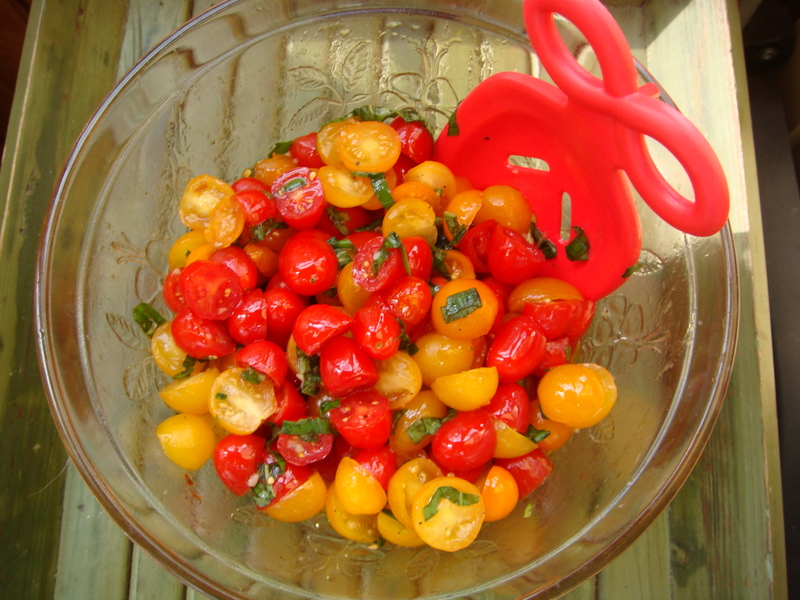 Take 4 pints of small grape or cherry tomatoes, and cut each one in half. I like to use half red and half orange for color. 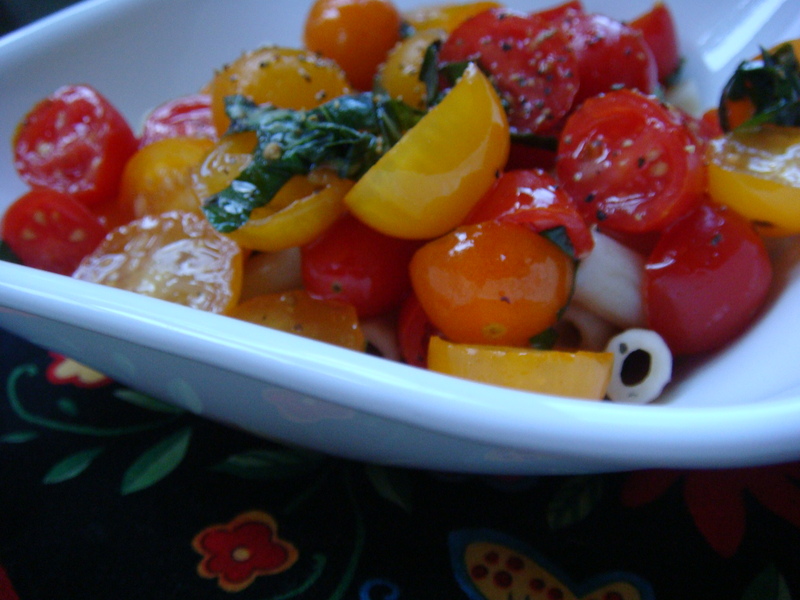 Place cut tomatoes into a large bowl. Sprinkle the cut tomatoes with salt and pepper, add 2 tablespoons of crushed garlic, a sprinkle of crushed red pepper, and 15-20 fresh basil leaves, cut into strips. Now pour ½ cup of olive oil over this lovely mixture. Cover with clear plastic wrap and WAIT…. 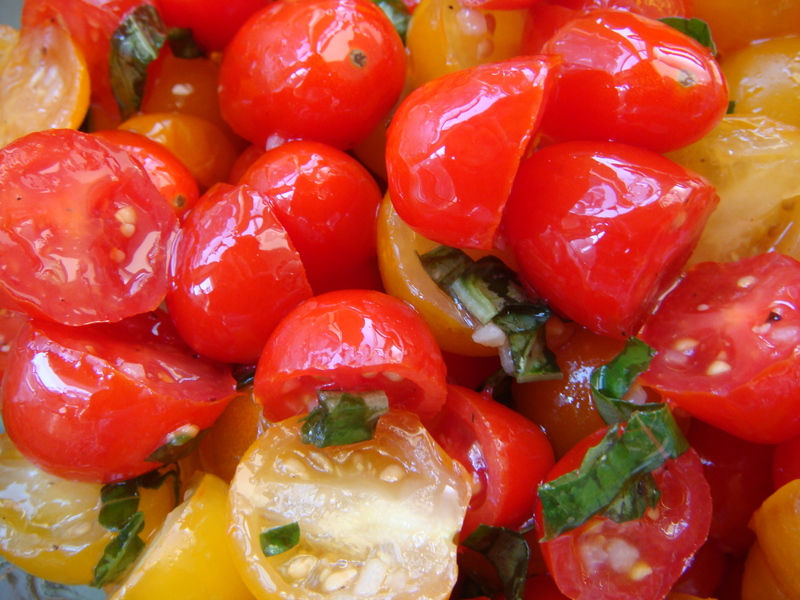 The tomatoes will marinate and all of the flavors will marry each other…it will be delightful! into a nice-sized bowl and then the magic happens! Place some nice heaping spoonfuls of the fresh “tomato sauce” onto each pasta serving. Do not use a slotted spoon….you want to get every last drop of the marinade into the bowl. Sprinkle with Parmesan cheese and done!